We cracked open a couple of windows on the weekend and it felt like spring was so close I could taste it. Smell it actually. And what I smelled was mud. The kind of mud that comes from a lawn that spent months buried under heavy snow. Maybe it's a smell that can't compete with roses, but it's nevertheless quite welcome in these parts. And open windows - that is living the dream! Even if they are only open a crack, and only for a couple of hours. 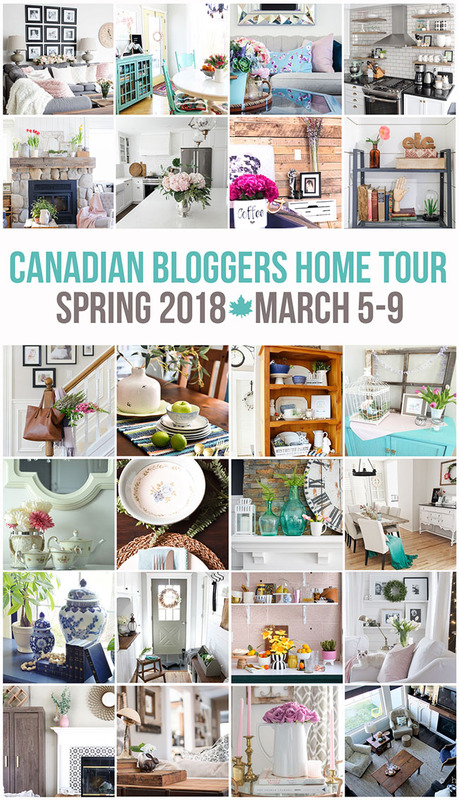 With spring on the brain, I'm happy to participate in the Canadian Bloggers Home Tour, spring 2018 edition. Thank you to our hosts, Shannon of Home Made Lovely and Christina of The DIY Mommy for organizing the tour. New homes will be posted each day this week, so be sure to come back and visit the other bloggers through the links at the bottom of this post. My sincere thanks as well to the wonderful people at Afloral for sponsoring this post. If you are in need of spring floral decor touches for your home, be sure to peruse Afloral's gorgeous (and affordable!) wares. My spring tour focuses primarily on tabletops. It only makes sense, because so much of life revolves around food - preparing food, serving food, sharing food. 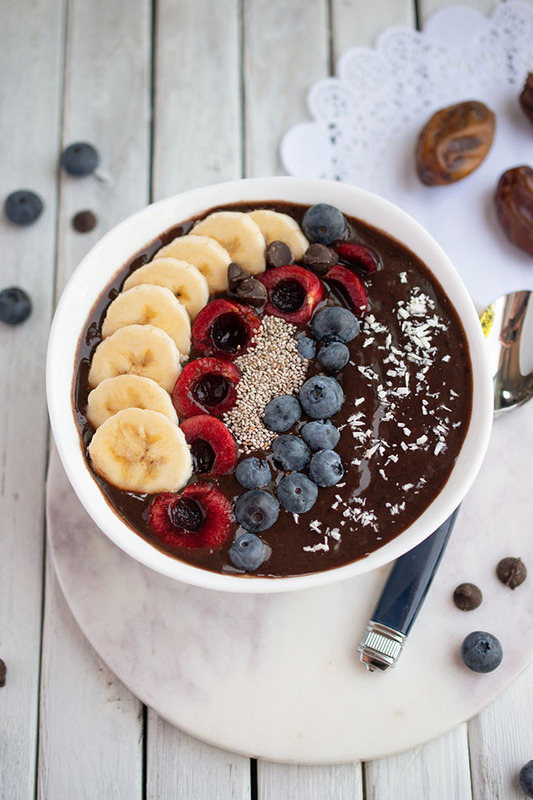 Oh beloved food! 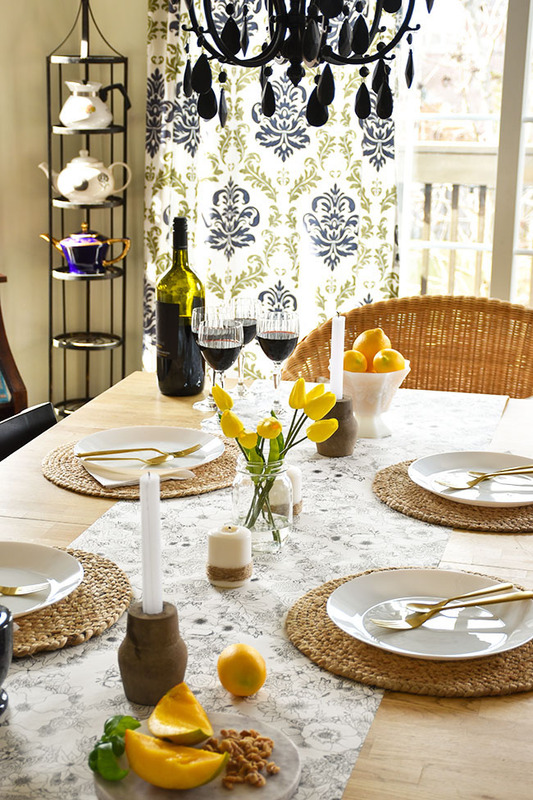 And when I think of spring and summer, I think of easy, pleasant, sunshine-inspired gatherings with friends and family. I confess that, (failed) perfectionist as I am, I'm not prone to holding impromptu, simple dinner parties all that often. But I'm trying harder. Trying not to create crazy, detailed shopping lists to buy ingredients for homemade everything, from appetizers to dessert. 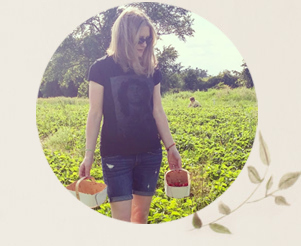 Trying to alleviate anxiety, to simplify, to buy some prepared goodies and to serve easy, wholesome foods. Because maybe then we can throw a dinner party on a whim and not worry so much about making sure the food and the house are perfect. After all, spring is the time to wake up, feel alive and share the joy with people you enjoy. I put together a simple yet pretty spring-inspired tablescape with hits of sunny yellow. I had a casual dinner in mind, and we actually had friends over for pizza, salads and brownies topped with ice cream after I took these photos. Yes it was all homemade, but at least it was casual food. Baby steps. 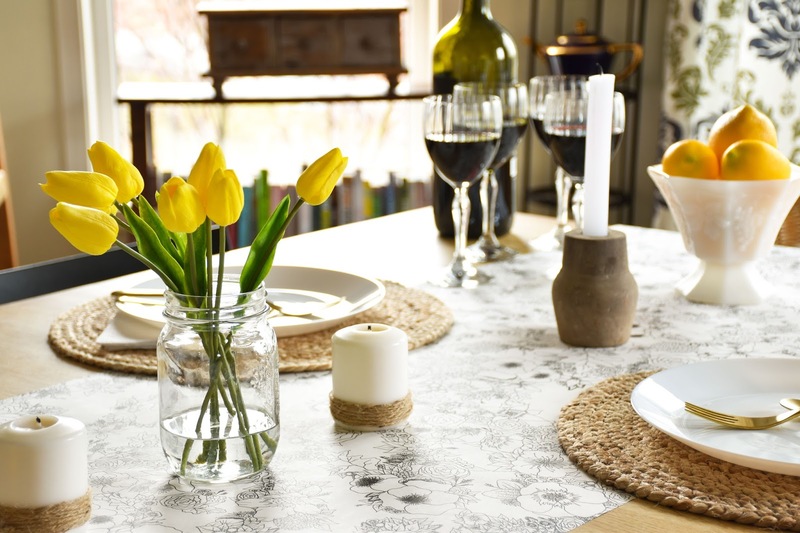 My heart was aflutter when I saw this black and white floral paper table runner. 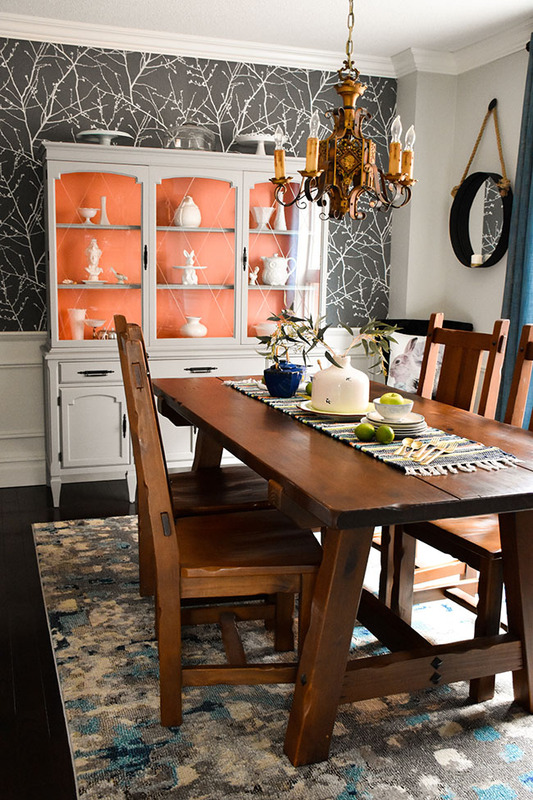 I knew it would be a perfect backdrop for a rustic yet refined spring dinner table. You can actually colour the table runner too so it's great for occupying kids. Heck, why not put out pencil crayons and let the adults have fun with it too? 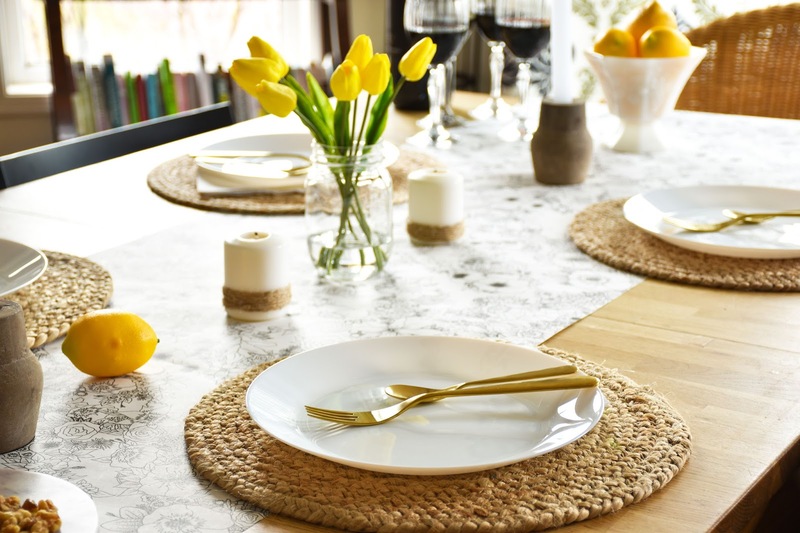 I also love these rustic chic round jute woven placemats from Afloral. For a touch of glam, I once again used the beautiful Amara gold flatware that I highlighted in this previous pink and gold tablescape. 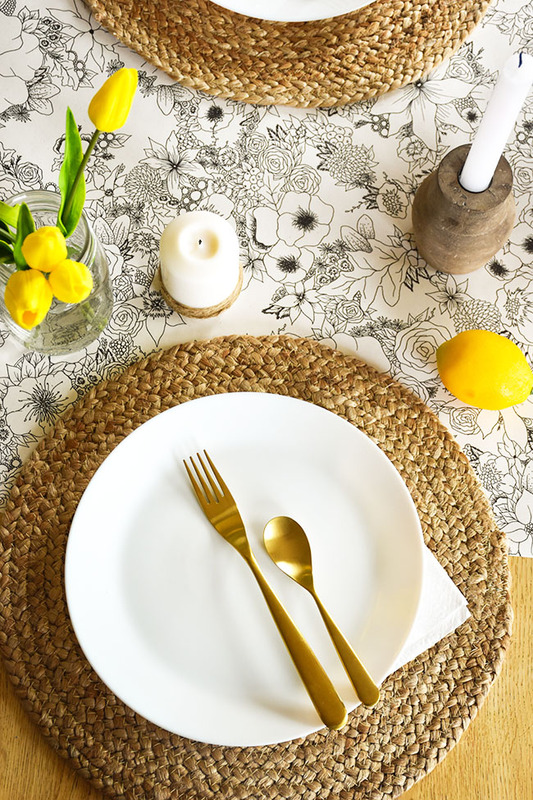 It's the A by Amara Paloma matt gold flatware set. I love using natural elements like fruit as decor. Lemons are a favourite. But I didn't want to worry about lemons rotting on the table, so I ordered a bunch of faux lemons from Afloral. I ordered two sizes so they'd have a varied (and more natural) look. I put some of the faux lemons in a milk glass bowl at one end of the table, and I placed a yellow Soft Touch Tulip Bundle in a simple canning jar in the middle of the table. I added a pair of Afloral wood and metal taper candle holders in keeping with the rustic natural feel of the table. 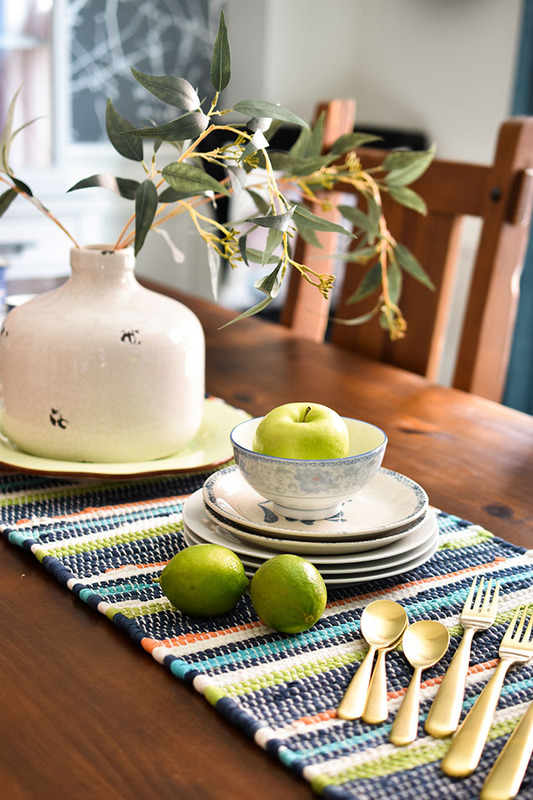 For the dining room table, I once again started with a table runner - this time a woven cotton striped table runner in blues and green and coral (to go with the interior of my china cabinet). Right now this table runner is on clearance for like two bucks. Not kidding. In the centre of the table, I opted for a ceramic Charleston Jug Crackle Vase with a filler of artificial seeded eucalyptus leaf sprays. I enjoy using faux florals and sprays because you can decorate the table and leave it for days or even weeks without worry. I set the dining table for tea, with thrifted cat motif tea cups and a decorative round white marble slab from Afloral. 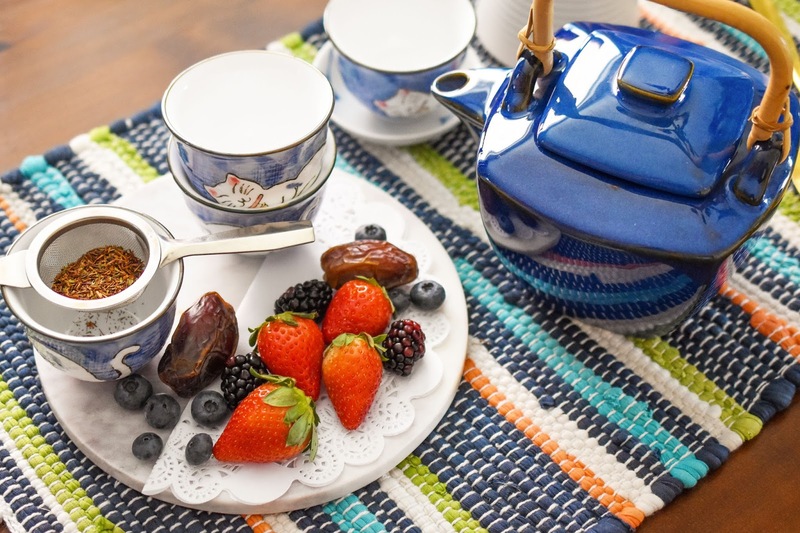 Spring is just the time to set out an array of berries, medjool dates and maybe a couple of slabs of sponge cake. 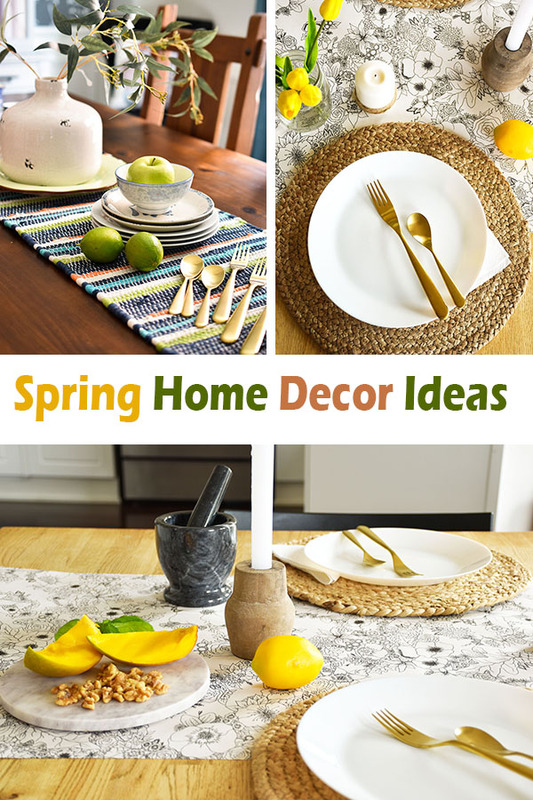 Limes and green apples make for lovely, natural spring decor touches too. 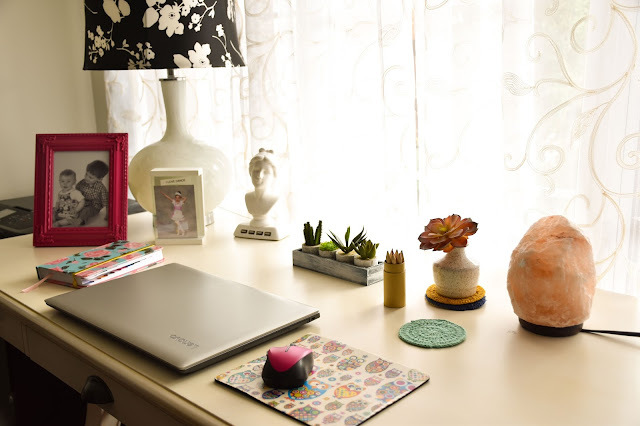 The final area I have (so far) decorated for spring is my home office. I wanted to add some cute floral touches that don't require care. (No green thumb over here!) 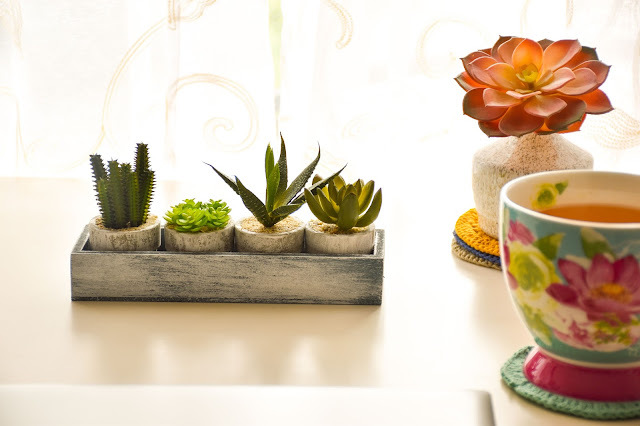 I also drink a lot of green tea at my desk, so I chose a set of warm, pretty round cotton crocheted coasters to protect the desk's surface. 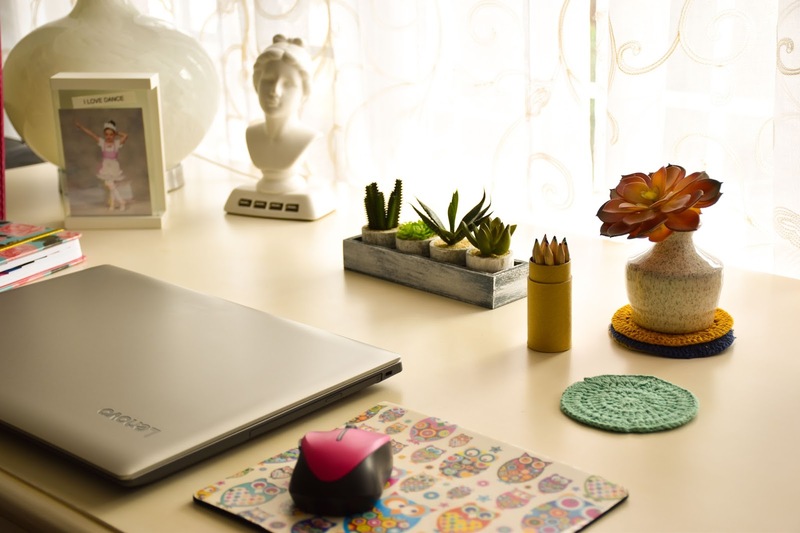 I also selected this adorable set of four artificial potted cactus succulents and an artificial echeveria succulent pick in mauve pink, set in this cute Hari Ceramic Floral Bud Vase in distressed white. Have you added any spring touches to your home? 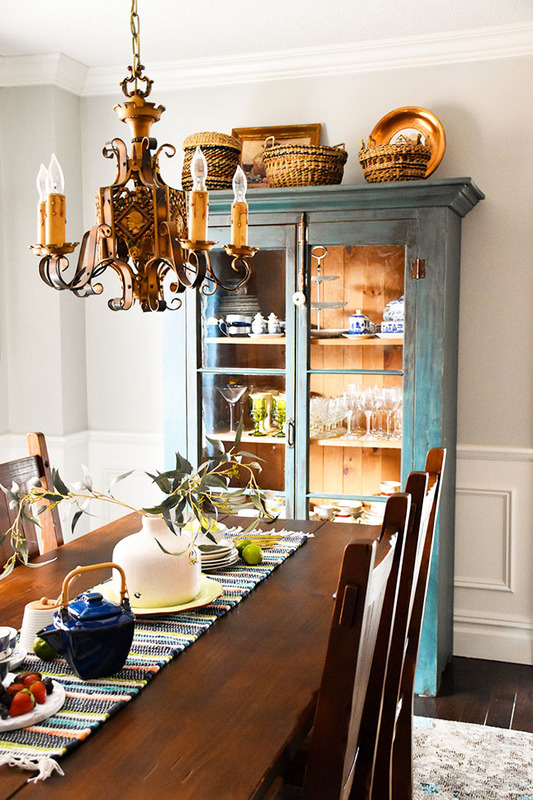 Are you a fan of simple, casual gatherings with family and/or friends? Have you mastered the art of impromptu parties? Be sure to visit the talented Canadian decor and lifestyle bloggers linked up below. I like your spring touches! So glad you joined the tour! Thank you Shannon! And thanks so much for co-hosting! Such a pretty table! I love all your natural elements. 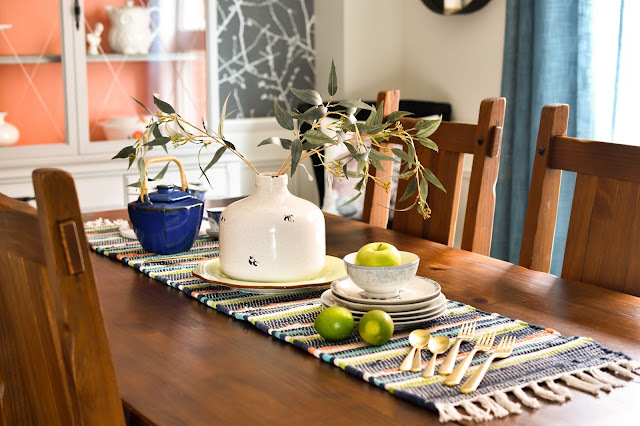 Love the table runner! And so drawn in by your writing. Thank you for sharing. Such beautiful, natural elements! Great springy touches! I know that smell you are talking about and I LOVE it...it means spring is on it's way! I can't wait. Your spring home looks so nice and fresh Joann! Any sign of spring is welcome, right? :) Thanks Jo-Anna! Yep, I use whatever I can find, hehe. 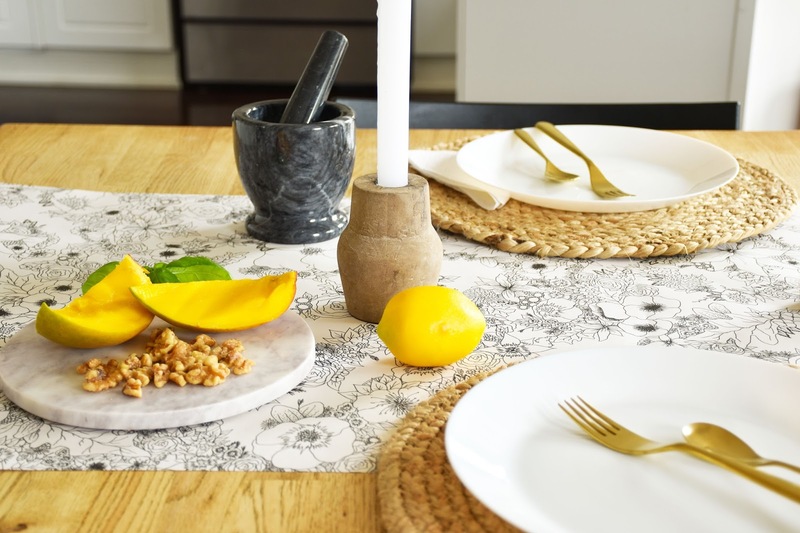 I love the table runner too! Here's to open windows my friend!!! Happy Spring! I kind of hope the bunnies don't come back, as sweet as they are. I don't want them near the dogs!